Springer… I’m not sure when I began liking the character, especially since he isn’t particularly well-written. He’s your typical ‘awesome warrior hero’ archetype, introduced as part of the 1986 Movie cast, searing itself to many G1 fans’ memories with awesome one-liners like ‘I’ve got better things to do tonight than die’ and going on to be basically the Jazz of Season Three. Of course, my personal first experience with Springer was from the black-and-white UK comic strips, where he was this leader of a breakaway group of Autobots named the ‘Survivors’. It wasn’t until I read comics like Stormbringer, Last Stand of the Wreckers, the Dark Ages or Target: 2006 that I began to actually like Springer, though. You see, while in the cartoon he’s this badass warrior, in the comics he’s the leader of the Wreckers, the Autobots’ best assault strike team with a very low survival rate. Springer is the leader of the bunch, usually succeeding from his mentor Impactor. He’s this awesome triple-changing hero who’s basically just awesomeness personified. I could go on and on about Springer’s exploits, but I think that’s not what this review is for, since this is a toy review. You see, back in 1986 Springer is a triple-changer, changing from a helicopter into a car and back into a robot again. Well, it’s not exactly fair to call him that, since Springer’s helicopter mode is basically the car with the wheels folded away, a tail folded out and a rotor blade popped on it. Still, G1 is G1 and that is gospel for any future Springer incarnations. 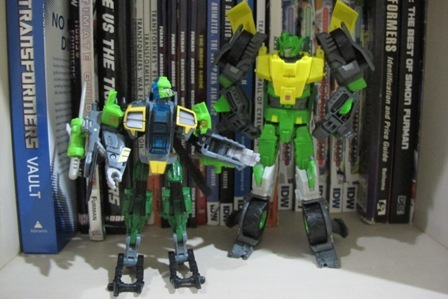 And, well, truth be told, despite not particularly liking the character until recently, I’ve always wanted a Springer toy, and without realizing it I’ve amassed a small Springer troupe. 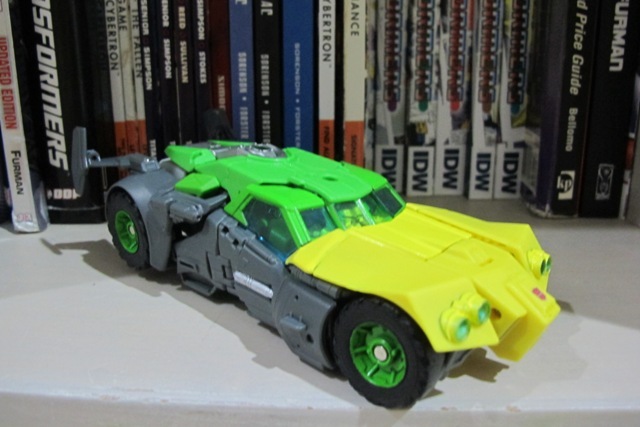 First up is a Springer toy from 2008’s Universe line, a very, very weak attempt at redecoing the Cybertron toyline’s Evac into Springer… the low yellow quotient and the lime green really don’t do it justice. I think I only bought the set to get the wholly awesome Ratbat toy that came with it. 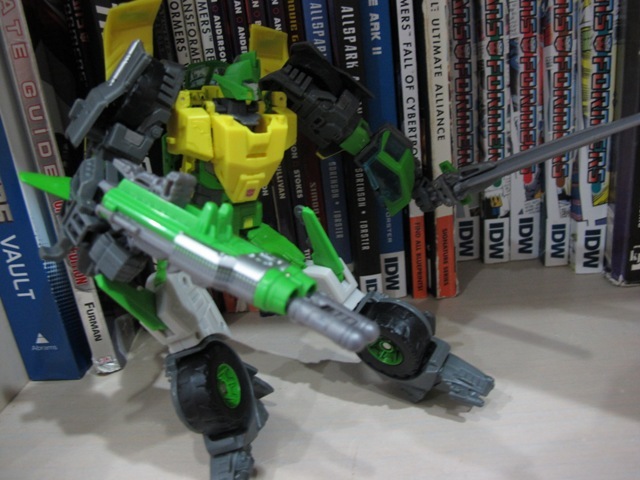 In 2009 I got the tiny little ROTF Legends class Springer, which, while cute, doesn’t really do a Springer homage. 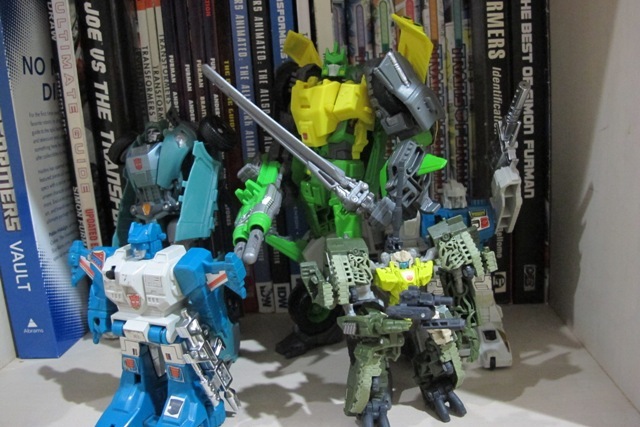 Inspired by the awesome comic LSOTW, last year I bought the Asian-exclusive Springer, a redeco of Tomahawk. It’s a wee bit closer than the other two due to the new headsculpt, but it still leaves much to be desired. Of course, no sooner than a week or two after my buying Asian Springer, Hasbro went and did an awesome thing and announced Voyager Class toys of ever-popular triple-changers Springer and Blitzwing. That news got me squee-ing. Both characters are favourites of mine (Blitzwing never did anything important though) and I wasted no time pre-ordering them. 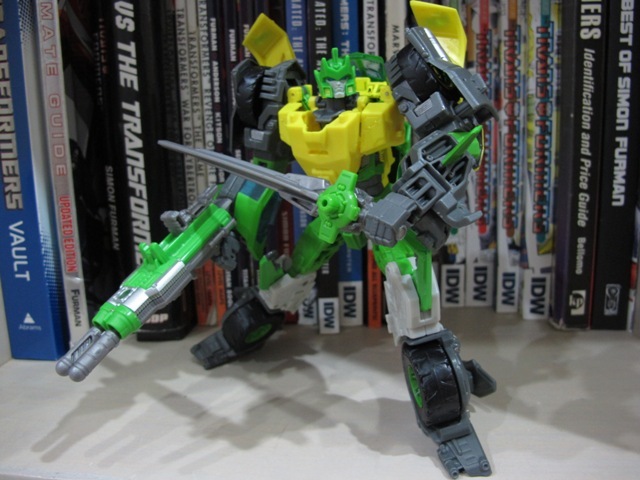 When pictures came out, I was even more excited� Springer looks simply gorgeous, based on the athletic and chunky Nick Roche redesign for the LSOTW comic – a comic, which, if you haven’t read, by the way, you should. And, as for the new Generations Springer toy? Well, like the LSOTW comic book itself… if you haven’t bought it, you should. In his robot mode, Springer is a dead ringer for his appearance in Last Stand of the Wreckers. Well, not such a dead ringer as there are some minor changes in order to make him be able to transform realistically, but it’s close enough and great enough so that you won’t mind. He’s a great mixture of green, yellow, dark gray and light gray, with silver highlighting mechanical detailings on his shoulder, legs and near his chest, red for the Autobot insignia on his stomach, black for the wheels, and some clear blue for the eyes and the windows that end up on his arms. Other than the giant wheels on his shoulders and legs (and I do really like the giant wheels) Springer is relatively kibble free… or at least, none that take away from the sheer awesomeness of his robot mode. I mean, his chest is obviously the car’s hood, and there are wing-like protrusions on his lower arms and knees, but these improve the robot mode and do not impede him in any way. Well, the ‘tailfins’ of the helicopter do stick out from the sides of his feet, but even these could be swung up so it folds away nicely behind Springer’s feet.This is, in essence, how kibble should truly be handled. By folding away and turning into parts of the robot mode. The instructions recommend you pull and angle out the yellow parts of the car hood away from the shoulders, but personally I like them tucked away nicely as if in vehicular mode. It’s a much better look in my opinion... the comic has the yellow parts as additional shoulder armour that goes over the gray parts, and I think show-accuracy can be achieved either way. Personally I think it looks much tidier tucked in vehicle-mode style, but he looks great either way. It’s great how every part of him look like some kind of thin, skin-like armour that covers his body. Springer’s robot mode is nothing short of phenomenal in looks. It’s just wonderful. The sculpting is not bad either, from the perfect face sculpt with a stern expression, to the grooves on the wheels, to the slight exaggerated angles that Nick Roche uses. And I like how the fists look like they’re slightly-clenched, yet also slightly relaxed at the same time, like how Springer would hold his hands while walking down a corridor looking badass. Combined with the excellent shades of plastic used for him, it makes Springer well and truly show-accurate. And his general appearance isn’t too far off from the classic G1 appearance either, only much better. Articulation wise? As a Voyager class, Springer has a lot of plastic to work with, but he keeps himself mostly free from any sort of kibble that would hinder his movement. His legs also have enough weight to support him through most poses. He’s got a great ball-jointed head, and thanks to how his shoulders are positioned, they enjoy a free range of motion. There is nothing to get in their way, after all. The elbows are double jointed and the wrists are double-jointed as well (as opposed to normal ball joints). And despite his wrists being buried in fairly chunky wrists he still has great wrist articulation. He’s got a waist joint, and the otherwise-negligible piece of kibble on his back can actually move backwards to allow for a full 360 degree rotation, something I don’t think I’ve ever seen before in any toy with backpacks. His thighs are double-jointed, his knees are on fabulous weight-bearing ratchet joints and his ankles are hinged. Yes, he comes with a sword and gun. 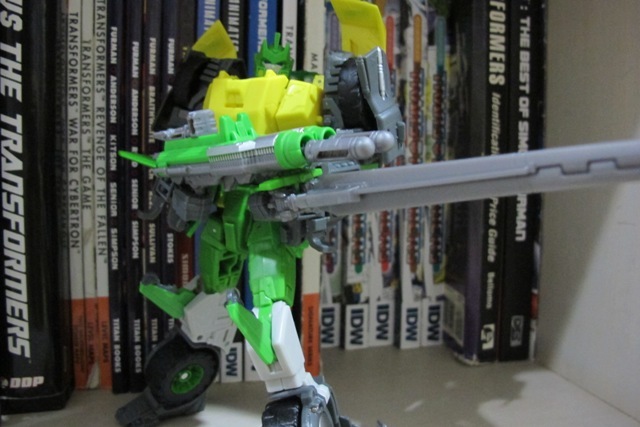 And unlike Blitzwing’s dinky affairs, Springer’s sword is a wondrous affair. It’s as long as his arm is, and it actually turns into his helicopter blades, like the G1 toy’s did. It’s a great looking sword, too, which is a bonus. And instead of a generic gun like his G1 toy had, Springer comes this time with a wicked-looking missile launcher, which is coloured in the same paintscheme that Springer is, minus the yellow. It’s also a great toy, the missile launcher is. It’s got a pressure-launching system instead of a conventional spring-loaded one (ironic considering Springer’s name) and pushing on the lever fires the missile one at a time rapidly, something that inexplicably fills me with giddiness. The handle on the missile launcher is even articulated so Springer can hold it at an angle like a wicked-looking shotgun. And because an awesome sword and an awesome gun aren’t good enough, Hasbro added a second peg onto the side of the hilt – a peg that’s unobtrusive otherwise since it is part of the green-coloured crossguard – which can be attached to the underside of the missile launcher to form an insanely long bayonet. Wreck and rule indeed, it’s an awesome-looking weapon. What is there to say about this robot mode? This wonderful, wonderful robot mode? I do not exaggerate… looks, show-accuracy, balance, colours, articulation, accessories… Springer simply ticks off every box, and then some. 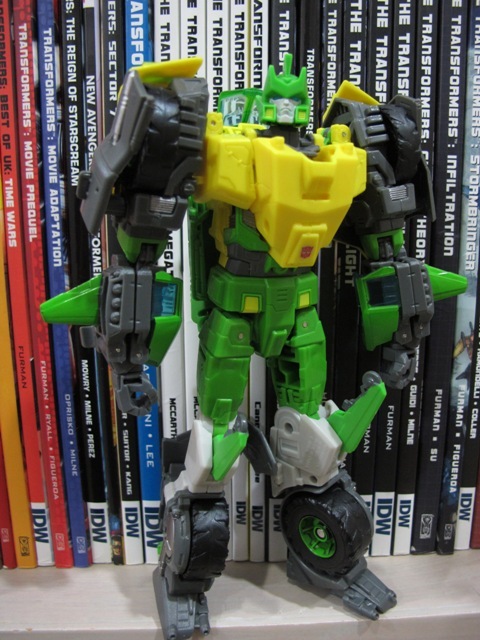 Now G1 Springer’s toy is a bit of a cheater. 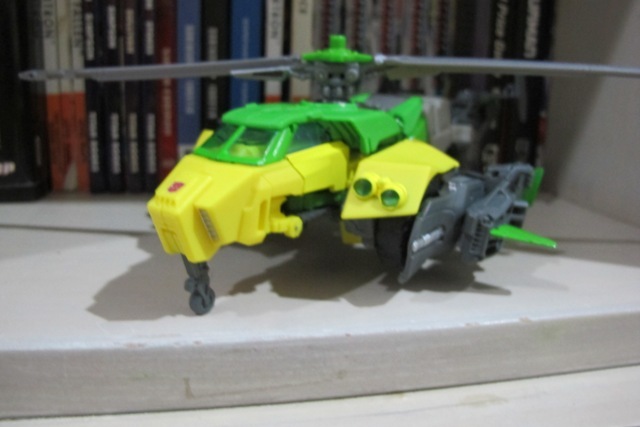 Advertised as a ‘triple changer’, he didn’t so much as change from a robot to a helicopter to a car… while Springer did transform into a helicopter, the car mode is ore of awkwardly folding the helicopter tail around the helicopter’s main body, and folding the arms inwards to reveal wheels, and calling it a day. A glorified in-between step with wheels tacked on. Not really the pinnacle of toy engineering there. Of course, the cartoon and comics made the helicopter and car mode look much cooler than they had any right to, but the toy remained crap. And all the pathetic attempts at repainting Springer usually only bothered with one mode or the other. Well, not Generations Springer. Because damn the G1 toy’s limited engineering, this is nearly thirty (well, twenty-six if you want to be nitpicky) years after the fact, and toy engineering has damn well improved, despite what some of Hasbro’s products might imply. Springer’s transformation to the helicopter mode is pretty well-executed, and while it’s obvious that the ‘tail’ is made up of the robot legs and the side-wings are the robot arms, they have so much detail molded into them that it’s actually pretty easy to pass them off as vehicular parts. Futuristic vehicular parts, I admit, but they look vehicular enough to let me forgive them. There is a bit of gap between the shoulder yellow pieces and the main body of the helicopter, and the way the lower arm breaks apart to form the side-fins and wrap around the chunky sides of the helicopter aren’t very solid either. The tail looks good, though, even if you’ll see wheels if you see it from the bottom. From the side, the mechanical detailing and the tail-wings make it look like some kind of futuristic, mechanical tail-rotor thing. I’m a big fan of how it ends up looking, though, as long as you transform him properly. A pretty chunky-looking attack helicopter. 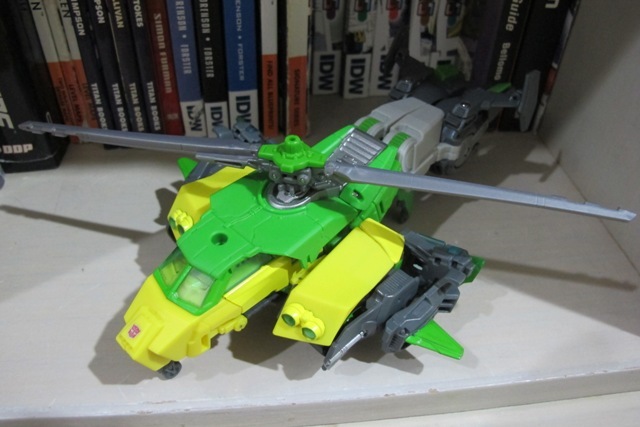 And to add, Springer’s helicopter mode is a pretty good attempt at replicating the Nick Roche design in LSOTW, right down to the funky angled shape of the tailfins. It’s not a perfect match, obviously – it’s missing two chunky green tube-things next to where the helicopter rotor mounts – but it’s close enough and looks good enough that it doesn’t matter. In addition to the moulded silver turret-like things that adorn the sides of Springer’s helicopter mode, the missile launcher can attach under Springer’s nosecone, although it takes a bit of fiddling since it isn’t immediately apparent that there are notches on one of the protrusions on the launcher that can attach onto a recess on the tip of Springer’s nosecone. As with all airborne-related ‘attack modes’, this looks rather unaerodynamic, although Springer himself is chunky enough for it not to matter. He stands pretty well using the knee-spikes and a nosecone landing gear. As mentioned before, the sword splits apart, and the crossguard can move into position on the top side of the rotor blades. Through some trick involving gears, this unlocks the spinning gimmick, and the rotors spin as freely as any other helicopter toy, whereas it is a very static and stable sword. Great stuff. Despite what may seem to be a problem there, it’s actually a result of me nitpicking to find something bad to say about the toy. I really, really do like this helicopter. It’s angled, it’s wicked looking, and it looks suitably badass for a Wrecker. And the rotors turn. Now you actually have to transform Springer into car mode instead of just ‘fold arms in, remove blades, fold legs around’. The car mode even features a different cockpit compared to the helicopter! Yes, it’s not the most complex of transformations, but it’s still far more complicated than what I expected, with more parts that move around to turn the helicopter into a car and vice versa. The toy really clicks together very well, and I personally prefer the car mode to the helicopter. It looks pretty tough and fast at the same time, something that embodies Springer’s character. The beautiful hood (even though the yellow parts don’t exactly match up perfectly), the altered windshield sections, and how every gray piece that make up Springer’s sides simply all click together perfectly… it’s great how they managed to make his car mode distinct from his helicopter mode. I love the big, chunky wheels, and the tiny little molded guns on the sides of his vehicle to what look like fuel tanks (those green things with an ‘X’). And while it’s a bit lazy for them to have the helicopter tailwings turned into funky spoilers, it’s not a move I’ll contest. I don’t think Springer ever transformed into his car mode in Last Stand of the Wreckers, but concept art tucked onto the back of my trade paperback has artwork of him in his car mode. It’s not a perfect match (for one, missing the tube-things that were on the helicopter mode again, which confused me) but it’s close enough for something that doesn’t appear on the comic proper. 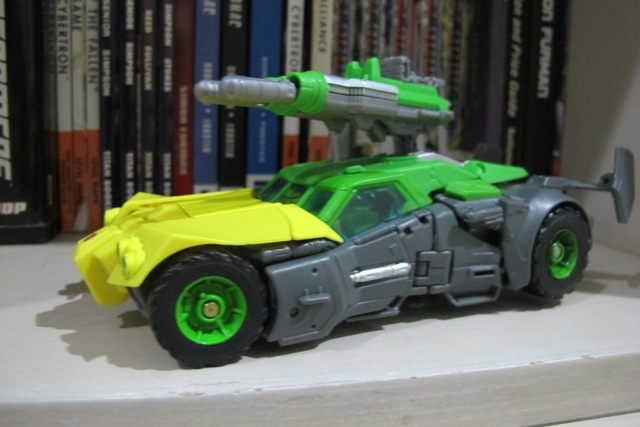 And for them to go all the way to make the car mode so distinct, well, unless you’re familiar with the original Springer as a toy, I don’t think you can look at him and say he’s a triple-changer, unlike modern toys of Blitzwing or Astrotrain or Octane who has chunks of their one alternate mode showing up on the other. Springer’s sword can clip slightly loosely between some yellow bits, although not quite as secure as the missile launcher in helicopter mode. Not a big problem for me. The missile launcher attach to the hole on Springer’s roof, and since it’s angled you can have it aim straight forwards to take down Decepticons driving in front of Springer, or angled upwards like a tank to shoot down airborne ones. And it can rotate. Just like the rest of him, I think the car mode is a great, solid one. Transformation Design: 10/10 Ingenious. Springer takes a rather lazy design from G1 and turned it on its head, making both helicopter and car mode distinct from each other, making both modes look damn good, without compromising the robot mode. The helicopter mode is ever so slightly weak, but it’s negligible in the grand scheme of things. And his transformations between all three modes are seamless. Durability: 10/10 Springer is a very sturdy toy with many ratcheting joints that are less prone to damage than conventional ball joints. Both his accessories are large and chunky and you probably wouldn’t lose them. The only area you’ll probably accidentally break is his rather complex lower arm assembly, and even then that’s a bit of a stretch. Aesthetics: 10/10 If the review hasn’t been clear enough: this is one damn gorgeous toy in all three of his modes. Articulation: 10/10 He’s got all the articulation you’ll ever need, and some. The waist joint is a bit hindered by the back kibble, but as mentioned above the kibble can be moved out of the way... and I think it’s realistic for transformers to be able to do that. He’s slender and tough-looking at the same time, and damn articulated and could be put into most poses you want him to. Coming with a big sword doesn’t hurt posing options either. Fun: 10/10 Oh, I did have a lot of fun with this guy. He’s going to stay on my desk for a long, long time. Value/Price: 10/10 A toy this good, you could ask me to pay Takara import prices and I still wouldn’t complain. Overall: 10/10 Perfect. Simply gorgeous and perfect. I had to actually actively search for any flaws because I thought he was overrated… and gaps in the helicopter mode aside, I don’t think there is anything positively wrong with him. He is grand and fabulous and simply knocks every other Springer toy (including the original) out of the game. 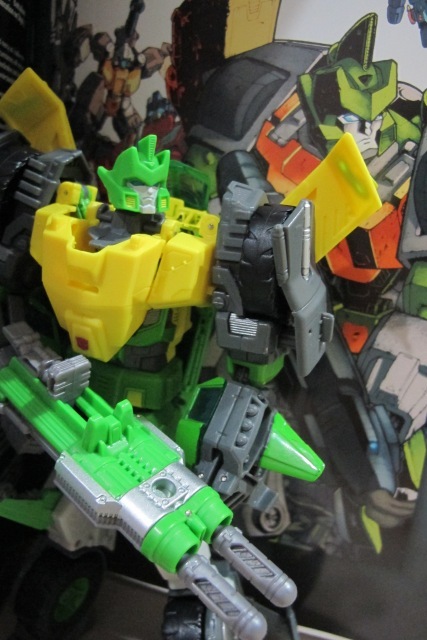 It is actually a good thing the rest of Hasbro’s output can’t be half as good as Springer, otherwise I’d be broke. He’s a great toy, and I cannot recommend it enough. This is the definitive Springer. Blows away any other attempts at Springer toys clear off the game, and sets a new standard for Transformers toys in general. Buy this guy.